I made a batch of these over the weekend for our company potluck. Many of my coworkers asked if it was food coloring! Gasp! How uncouth. Surprisingly, a little bit of green tea powder goes a long way, both in terms of flavor and color. As most of you know, I am a big fan of cocoa nibs; if I could, I would probably add a dash of it to everything I ate. It imparts a crunchy textural quality as well as a deep, earthy, chocolaty finish to any food it flavors. These little treats are delicate and subtly sweet. The sugary crust around the edge gives a bit more of a crunch, along with the nibs too. Next time, I will use a couple more tablespoons of butter and may even try to incorporate the nibs into the dough itself before rolling out. 1. Cream butter with confectioner's sugar and matcha powder until smooth and evenly mixed, about 2 minutes. Slowly mix in the flour until well incorporated. Add the yolks one by one, mixing after each addition. The dough will start to come together when large clumps form. Turn out the dough onto your board and form into a disc. Cover in plastic wrap and refrigerate for about 45 min. 2. Meanwhile, preheat oven to 350F. Line baking sheets with parchment paper. 3. Roll out the dough into 1/4" thick disc. Cut the dough with cookie cutters. Gently lift out each cookie, roll the edges in sugar and place on the prepared pans. Add a pinch of cocoa nibs to each cookie and press down into the dough. oh how pretty! i just ordered a packet of matcha powder. i can't wait! might just make these gorgeous nibbles. cheers for sharin. They look very pretty and delicious! Wonderful! Looks delicious. I have a pack of nibs sitting in the back of my baking shelf I've been wondering what to do with. Now I know! Yum! Two of my favorite things in one cookie! I have also been experimenting with Matcha - it is great stuff - the colour is incredible. 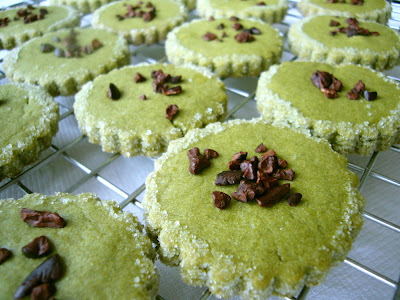 These are so beautiful--and I love the way that green tea cookies taste--subtle but sublime. cocoa nibs and matcha powder are two ingredients I like too. Your shortbread look delicious. Perfect for afternoon tea. 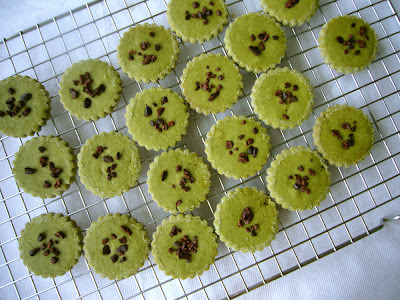 Green tea shortbread is a great idea!! I also really like th cocoa nibs on top! Help the Maryland Food Bank! Win round-trip business class airfare for two to London on British Airways. It’s only $20 per chance and all proceeds benefit the Maryland Food Bank($1=3lbs of food). The drawing will be held at our 2008 Blue Jean Ball on May 2, 2008. Ticket quantity is limited…so act fast! What did you use for your green tea powder? 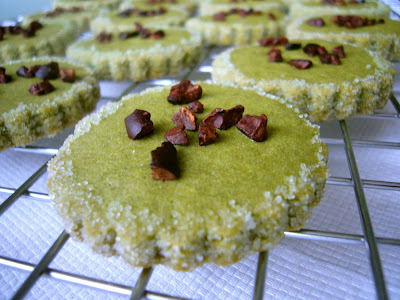 Would something like this work - baking matcha?